Over the past few years, virtualization has gained popularity, and with good reason. 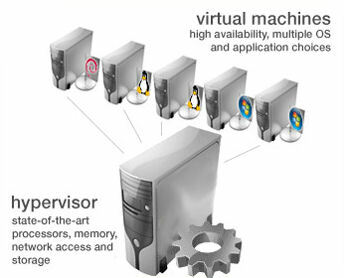 Virtualization brings virtual infrastructure solutions to drive out costly hardware and maintenance that weigh you down. By decoupling hardware from software, this IT service consolidates computing resources to optimize performance and reduce downtime. Take your business beyond the limits with virtualization and join the transformation. Digital nGenuity is proud to offer this IT service reducing the need for hardware and upkeep, improving data accessibility, and providing high availability. Digital nGenuity provides virtualization to small and mid-sized businesses in Atlantic Canada. This IT service includes network, server, desktop, application, and storage virtualization.